42nd street and 7th Avenue in Times Square is a busy place no matter what time of day you visit. Tourists, residents and workers make their way through Times Square by walking when they are not using MTA buses, NYC taxis, private vehicles or Uber. New Yorkers often find themselves waiting for the steady stream of vehicles to pass and most are observant of the traffic signals. This painting shows a crowd stopped in its tracks, waiting to cross or waiting on a ride and careful not to enter too far into the driving lane. 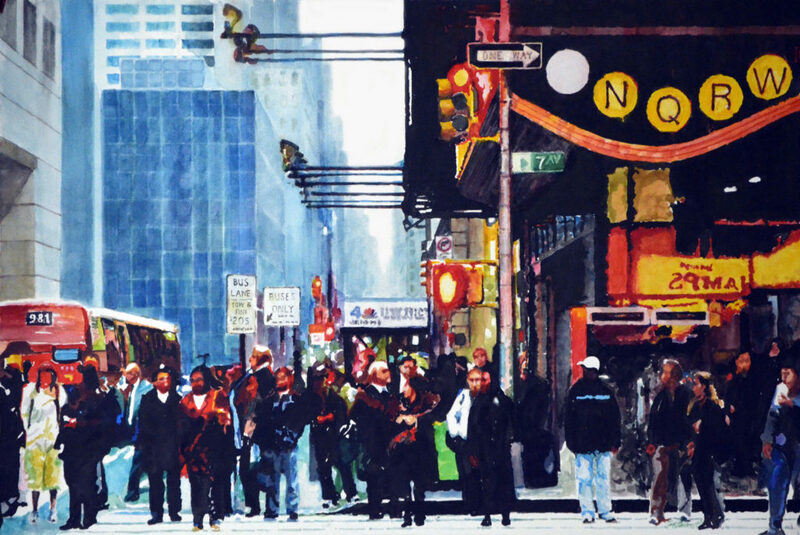 The painting originated as a wide angle shot but was cropped down to take advantage of the subway station in the foreground with the crowd and the much cooler buildings in the background. I love the cast of characters in the crowd patiently waiting during rush hour which, in Times Square, is almost every hour. 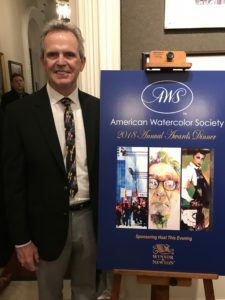 This painting recently returned to NYC at the Salmagundi Club with the 151 st International Exhibition of the American Watercolor Society. Ted has issued a limited edition of this painting as Giclée reproductions. The reproductions are created using archival inks and paper. The image size is 14 x 21 (the same aspect ratio as the original) painting. Each piece in the edition is numbered and signed by Ted. Each is expertly framed ready to hang in office or home.